Although not as huge and as magnificent as the most popular churches in England, don't let this charmingly quaint church building throw you off. The St. Martin’s Church is the first church founded in England, and hence the oldest. 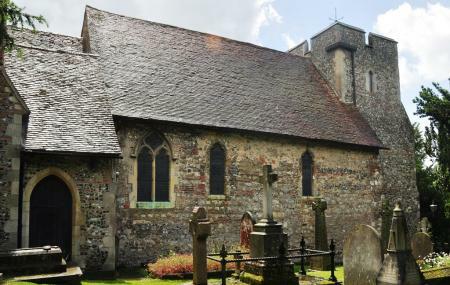 A World Heritage Site, this church, infact, is the oldest church in the entire English-speaking world. It was here that Queen Bertha prayed back in the 6th century, and it was this church that St Augustine made his mission headquarter. Tuesday, Thursday and Saturday: From 11am to 3pm. Sunday: From 9.50am to 10.20am. How popular is St. Martin's Church? People normally club together St. Augustine's Abbey and Wildwood Discovery Park while planning their visit to St. Martin's Church. A very special place. Set off the main road, the little street rises up towards the church, which itself has a raised and circular(ish) site on which yew trees surround the building. The exposed brickwork tells the story visually of the building, while some unusually detailed headstones shine a light on the individual stories of some of the people buried at the site. One of my favorite places to visit in Canterbury. Very old historical church. Beautiful interiors. The oldest English church that has been in continuous use. Renovated in the 6th century by Queen Bertha, the church is thought to have originally been in use in the late Roman period before falling into disuse. Forms part of the World Heritage site. It was closed when I got there. But it was nice to visit an ancient Church. Historically important church for England. Non descript to look at.